That’s a trademark phrase on Once Upon a Time, but it’s also what I kept thinking as the Evil Queen did her thing on the episode Changelings. Last week, Rumplestiltskin gave her an ultimatum if she wanted him to keep helping her get her happy ending. Basically, she had to kill her sister Zelena, the one true bond she’d formed, and the one she actually put effort into keeping solid. But I guess all Rumple has to do is tell the Evil Queen they can have the privilege of ruling together. So all that sisterhood stuff? Well, she can pretty much forget it. And she does. I suppose motherhood really took something out of the Wicked Witch, because it seems like she’ll actually go down pretty easy until Regina shows up and threatens to crush her own heart to stop the Queen. But just when it seems like a sisterly bond is about to be reforged, Regina reveals that she just can’t forgive her sister for Robin’s death, which seems a bit harsh. I seem to remember Zelena not even being in the room when Robin bit the dust, and even choosing Regina over the man she loved. So you’d think Regina would cut her some slack, but nope. Then again, on an episode titled Changelings, it’s not going to be the bond between sisters that gets explored, it’s going to the be the parental one. 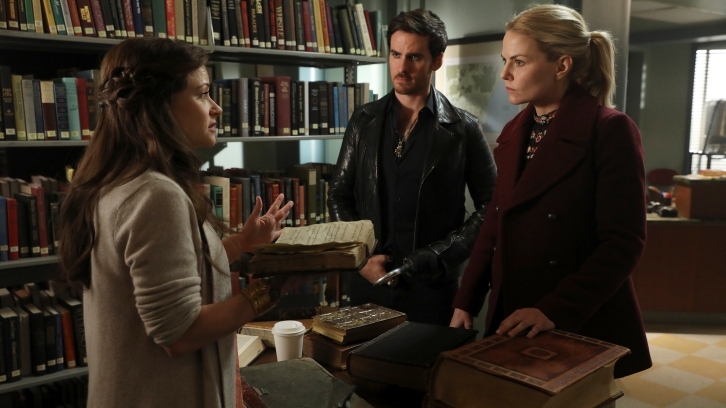 Mostly, this episode is about Rumple and Belle’s competing visions for their son’s future. Rumple believes this is his last chance at love and a family, but Belle is driven to give their child his best chance and keep the child from the darkness that has consumed his father. Once adds a little something extra though. Remember there was a whole thing about Rumple’s father being Peter Pan? Well, it turns out there’s quite a story behind his maternal line too. Maybe Gold never had a chance, since it turned out his mother abandoned him long before his father ever did to pursue her own dark path. Perhaps you can never truly escape your past, because her darkness also involves the theft of children, much as his father’s did, and likewise continued with the Dark One. His son might not fare much better, especially when Belle’s pregnancy is magically sped up, and she is driven to desperation to protect their son’s future. Gotta say, you could really tell she’d had a child of her own recently, as her performance during the birth scene seemed very genuine. In the background, Emma’s visions reveal another piece from her future, giving her hope that she can solve her murder before it happens, and Aladdin becomes the new genie so that he and Jasmine can find Agrabah. Of course, if next week’s episode preview is any indication, looks like that might really backfire, seeing as how the Evil Queen and Gold are finally enemies again. Looks like the relationship no one ever, ever wanted will finally end. At least Changelings did right by its subject matter, especially since it seems as if Gold’s mother might just finally get her due. If only other bonds were explored as well.